MAC5 steam irons are perfect for faster ironing and stunning results. 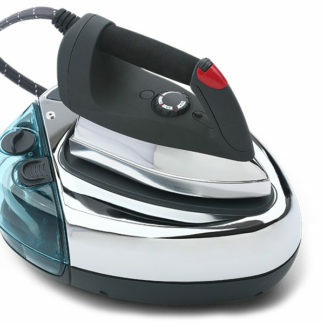 With a larger water tank than a conventional iron, a steam generator iron lets you iron for longer. You can use all MAC5 steam irons with cold tap water, therefore cutting down on the cost of buying demineralised water. These steam irons all work with a 1.5mm thick stainless steel boiler with external heating element. Cold water is held in the water container, then, as steam is called for, this water is drawn into the boiler. The boiler then heats the water, generating and delivering steam to the clothes press or iron. This means that you can re-fill the water reservoir at any time, giving uninterrupted ironing. If you have any questions about the MAC5 steam irons, please call us on 01825 768899. Alternatively, chat to us in the box below, or use the Contact Us form here.